Difficult to understand and impossible to codify, Manifesto is a stirring post-modern rumination on artistic meaning filtered through the persona and performance of Cate Blanchett. Attempting to codify director Julian Rosefeldt’s Manifesto is like attempting to unify a mass of artistic movements into a clearly defined and coherent whole without contradiction. Which makes sense, as the apparent theme behind Rosefeldt’s film is that the nebulous nature of art defies definition or unification. 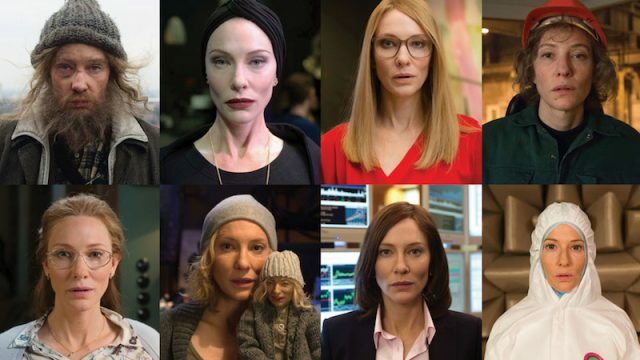 In Manifesto, artistic movements interact with, react to, and undermine one another through the person of Cate Blanchett, who represents them on screen, and through the mis-en-scene that mirrors the essence of the words, just as the words mirror the essence of the art they describe. Manifesto creates a loosely defined argument comprised of thirteen vignettes, all of them featuring Blanchett as the central character in a variety of roles from different social classes, ages, and professions (among them a school teacher, a punk, a grieving widow, an industrial worker, a socialite, and a homeless man). The monologues she speaks draw on the writings of numerous 20th century art movements, from Pop Art to Futurism to Dogme 95, as well the writings of individuals including Andre Breton, Karl Marx, Yvonne Rainer, Jim Jarmusch and Claes Oldenburg. Rosefeldt combines and rearranges these arguments into a “new,” obliquely post-modern manifesto—one that proclaims that “nothing is original,” yet finds originality therein. The result is a collage of visual, aural, and verbal elements that becomes a debate over the meaning and purpose of art. At first, I was of the opinion that Manifesto probably plays better as an multimedia installation piece than as a single, ninety minute film, but I’ve since reconsidered that position. Manifesto makes an artistic argument made of the sum of its parts, and to only experience a single vignette or even several vignettes in its entirety—as one likely would in a multimedia installation—would mean to miss the way that the vignettes interact with and inform on one another. The way that Rosefeldt has edited the vignettes together means that characters, symbols, and images are returned to several times over the course of the film, forcing the viewer to bring the various artistic manifestos into argument with each other, and to understand them as a multi-pronged conversation rather than a single concept. The mis-en-scene is as important as the words themselves. The film moves from a demolished landscape of rundown buildings, to cold, futurist interiors, warmer homes, landscapes, and classrooms, and back again, forcing these elements into dialogue with each other and exploiting their visual similarities as well as contradictions. Blanchett inhabits each of these worlds, her vocal range remarkable as she proclaims a Dadaist argument as a grieving widow eulogizing her husband’s funeral, or educates a classroom of children on Dogme 95. There’s humor in these juxtapositions, and the way that Rosefeldt edits them together (and Blanchett performs them) establishes a cheeky irreverence as well as love for each of the movements being depicted. Blanchett provides a comforting anchor in the chaos of debate, her presence acting as the viewer’s guide through the thorny patches of intellectual argument and attempts at definition. Her undoubted humor is on display, especially in the latter half of the film, and she appears neither self-indulgent nor self-conscious. Another—or a lesser—actress might have made the whole concept slightly pretentious, but there’s an honesty and clarity to Blanchett’s gaze that draws the viewer in. She’s evidently invested in the meaning of the art she’s producing; she respects the words she speaks, and the performance she’s giving. The difficulty with Manifesto is that, in spite of the undoubted star power of Blanchett, it’s more than fundamentally an art film – it’s non-narrative and the arguments are a complex collage of meaning that’s easy to get lost in, even if you know and are aware of the various writers from which the film draws. Repetition helps – we come to know what to expect from various characters that we return to – and the punctuation of humor in visual and verbal juxtapositions gives some respite from the almost constant use of voiceover or direct speech. I’m almost tempted to call the film surreal, but of course, that would be to undermine its meaning, because it’s not existing in any given school of art or artistic expression. At most, it’s post-modern, with all that phrase encompasses, but even that might prove an illusory definition. But that lack of clear definition and difficulty with meaning is also Manifesto’s strength. As a work of cinematic art, it defies codification. It begs for multiple viewings, if only to pick apart the concepts that it introduces, changes, and interacts with over the course of its run time. It has meaning, yes, but it’s a multi-layered and multifaceted meaning that’s not easily defined or understood. These are written manifestos being spoken, given visual expression through the cinematic medium (a defiantly 20th century form of art) and filtered through a 21st century artist and actress. In its structure and its argument, Manifesto hits at the essence of artistic cinema.